After the 8-hour day was won in 1856, more workers' unions began to form throughout Victoria's communities, but there was nowhere for some of the more established unions – like that of the stonemasons – to gather. Sparrow, J & Sparrow, J 2001, Radical Melbourne, Vulgar Press, Carlton North, Vic. 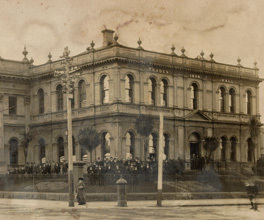 By 1859, unions had raised enough money to construct Melbourne's Trades Hall and Literary Institute. As the establishment was intended to educate workers and their families, a sympathetic government headed by Irish Catholic Premier John O'Shanassy donated land on the corner of Victoria and Lygon Streets. The original building was made of timber with galvanised iron roofing, but it was rebuilt in 1875 by John Reed, the architect responsible for Melbourne icons like the Town Hall and the State Library of Victoria. Trades Hall has had multiple uses in its time. In 1931, the hall was used as a broadcast venue for 3KZ, a radio station initiated by the Industrial Printing and Publicity Group as a means of spreading its message. 3KZ was a popular commercial station that featured music, variety shows and talkback, as well as occasional Labor movement announcements. The station gradually lost its union component and is now known as Gold FM. Trades Hall is still home to trade unions and political events, but has also taken on a more cultural focus. The hall is now a regular venue for theatre productions, art exhibitions and various acts at the Melbourne Comedy Festival. A world first and the beginning of Australia's reputation as a ‘worker's paradise'.